« What if Richie died and Jimi lived? 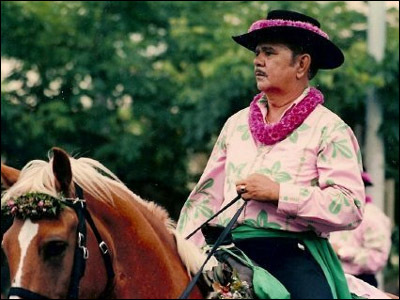 Gabby Pahinui, the humble king of Hawaiian music. 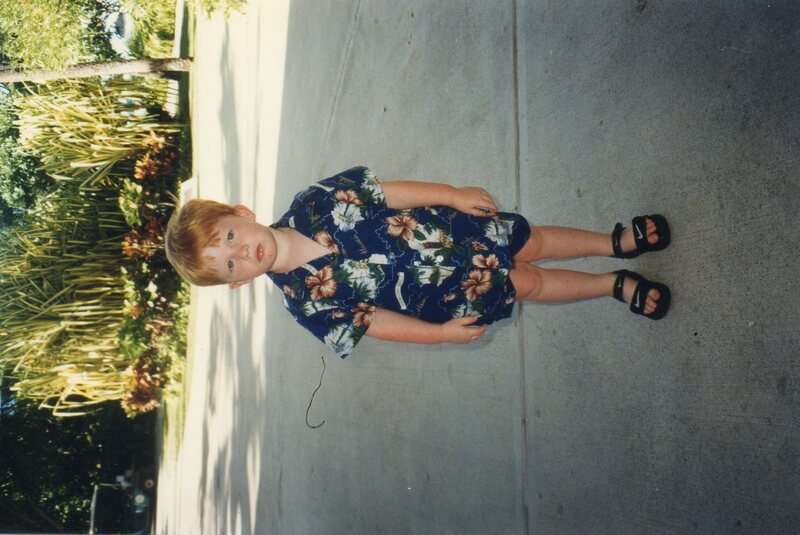 It was the longest, scariest night of my life, the time my son Jack came home from the hospital after being born. His mother and I had several people over to share in our joy, but when the baby started crying, then didn’t stop, our friends wisely said goodnight and left us with our cluelessness. Childbirth classes had prepared us for this moment like a stewardess’ preflight aisle demonstration does passengers for a plane crash. When you’re flopping amid a twisted metal explosion, do you really remember that your seat cushion can be used as a flotation device? The kid started sobbing uncontrollably and our minds went blank. Eventually he stopped crying, but that proved to be just a rest. We were in for a long night. I had the first shift, and when our little bundle started airing out those hacky-sack-sized lungs again, I held him and rocked him and tried to feed him, but he wouldn’t stop crying. He felt a little warm, but I was too nervous to even consider a rectal thermometer. “Soothing music,” I remembered. “That will help him sleep.” But I didn’t own any New Age CDs. Probably the softest thing I had was the Velvet Underground, but I was afraid if I played that, my child might grow up to be a junkie, or a tugboat captain. If he lived through the night, that is. Then I remembered receiving some Hawaiian slack key guitar records from George Winston’s Dancing Cat label in the mail a few days earlier. 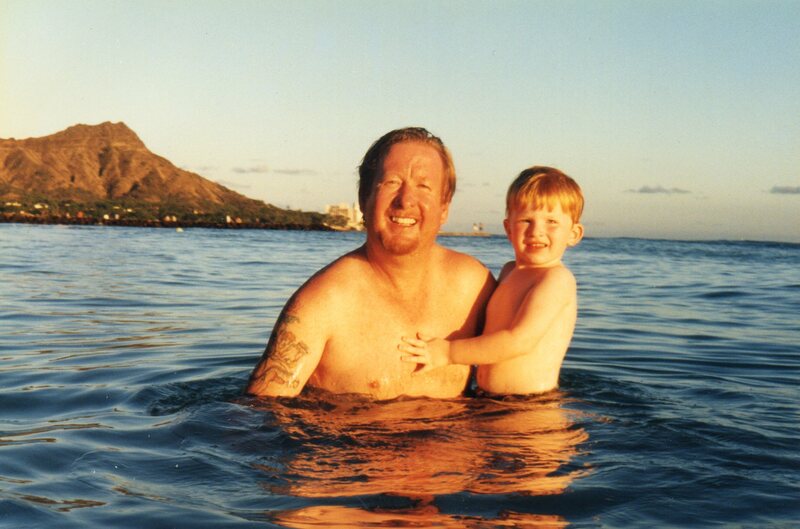 Since my son was conceived on a previous trip to Maui (don’t ask why I’m so sure), I thought there might be some sort of spiritual bond. Even after living in Hawaii for 15 years (or maybe because of it), I had never really liked Hawaiian music, but the time was right for tolerance, so I put on “Sonny Solo” by Sonny Chillingworth and felt the anxiety lift with the first track, “Moe Uhane,” which Chillingworth subtitled “Dream Slack Key.” Slack key or “ki ho’alu” is a finger-picking style of guitar playing that produces a lingering sound behind the melody. Similar to the playing of Chet Atkins, the slack key technique picks the rhythm, melody and bass, but the strings are loosened to create many indigenous tunings, which often mimic the yodels and guttural falsettos of Hawaiian singing. It is the rolling oceans, green forests and sudden mountains of Hawaii that seem to provide the deepest source of inspiration to the musicians, however. Listening to Chillingworth or other solo albums in the Dancing Cat series by the likes of Ozzie Kotani, Ray Kane, Ledward Kaapana, Cyril Pahinui and Leonard Kwan is the musical counterpart to watching a travelogue about Hawaii. Jack was soon sleeping, and I kept the music playing because I was afraid that when it stopped he’d wake up or I’d once again feel pink and helpless. Sitting there in the dark, listening to Chillingworth sing “Hi’ilawe,” (the 1955 Gabby Pahinui hit that’s to Hawaii what “Jole Blon” is to Louisiana or what “Rocky Top” is to Tennessee) while my little boy slept in my arms, is perhaps the most beautiful memory of that crazy and invigorating first leg of the parenthood journey. Sonny Chillingworth, the singing paniolo, helped soothe a howling newborn. Mine. native Hawaiian chants. Tunings, with names such as “Taro Patch,” “Wahine” and “Mauna Loa,” were often closely guarded family secrets, and those who wanted to learn slack key had to earn the trust of a master before they could intern. In the early ’70s, a slack key renaissance was sparked by a growing Hawaiian sovereignty movement and the rediscovery of Gabby “Pops” Pahinui, whom George Winston calls “the vortex of Hawaiian slack key guitar.” Pahinui is to Hawaiian music what Bob Marley is to reggae. You could also compare Pahinui, who died 15 years ago, to Willie Nelson, in that Gabby was an adored man of the people, who could play a state dinner for a visiting prime minister then walk across the street to jam with the blalahs at the Alakea Grill. 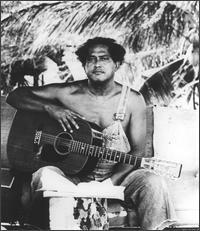 Both folk heroes were also heavily influenced by jazz, especially Django Reinhardt’s gypsy guitar playing, and they infused elements of the improvisational style into their otherwise traditional music.As a boy, Gabby Pahinui didn’t really like Hawaiian music. “(My parents) would bring out some old Hawaiian music, and I’d turn it off,” he said in a 1977 interview. “To me Hawaiian music all sounded the same.”When our military family moved to Hawaii in 1971, I felt the same way. Even worse than the traditional Island music, which I once compared in print to the sound of a dozen choking Chihuahuas, were the wildly popular mid-70s Hawaiian pop groups like Cecilio and Kapono and Country Comfort who incorporated slack key guitar playing into their update of Seals and Croft. These groups used to sell out the Waikiki Shell (capacity 10,000) three nights in a row. Meanwhile, when the Talking Heads played Honolulu in 1978, it was at the Little Orphan Annie’s nightclub, where a crowd of about 300 paid $1.50 to get in. When I tell people that I lived in Honolulu for 14 years, they invariably say, “That must’ve been nice.” But it wasn’t, really. The things I remember most about living in the Aloha State were poverty, sunburn, racism and cover bands. One of my earliest mentors, Bill Mann, (now a TV critic for one of the dailies in San Francisco) used to call Hawaii “the world’s most highly technologized banana republic,” and it sure felt that way when even the people at the bank spoke pidgin English. “We no can cash dees check wit’out one drivah’s license.” Whatever rebellious streak I was born with was intensified by spending vital years, from 10th grade to age 28, in a city, a state, a culture, where I didn’t fit. My old stomping grounds were covered with sand. But in recent years, beginning with that experience with the Sonny Chillingworth record on April 28, 1994, I’ve grown into affinity for Hawaiian music, especially slack key guitar. I’ve also taken to speaking in pidgin to my three sisters who still live on Oahu. Sometimes you need to get away from a place to really appreciate it, and maybe I can get a witness from someone from Lubbock. Why is it that when you’re lying together with someone in the dark you can see them much clearer? The same thing applies to former hometowns. 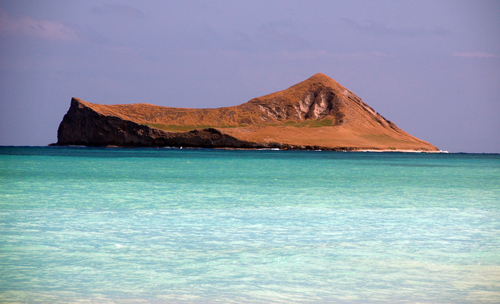 Turtle Island, the view from 'nalo beach. But you wonder how many people thought the same thing in August ’93, when Chillingworth played his last Slack Key Festival before succumbing to cancer the next year. I consider myself lucky because I was able to tell Sonny Chillingworth about how his music soothed a nerve-wracking situation. He was pretty sick and weak, so he let me go on and on, and when I was done talking he just said, softy, that hearing stories like mine meant so much to him. “It’s not the way the guitar is tuned. It’s not the movement of the fingers. It’s the soul,” he said. “That’s where it comes from.”That’s it. Slack key is sweet Hawaiian soul music, calling an adopted son back home. This article was written in 1997. About 10 years later, I picked up Jack from middle school and happened to have a copy of the Chillingworth CD on me, so I popped it in. After a couple minutes later I looked back and Jack was conked out, sound asleep in the back seat. This entry was posted on August 1, 2011 at 4:03 pm	and is filed under Uncategorized. You can follow any responses to this entry through the RSS 2.0 feed. You can leave a response, or trackback from your own site.